The Hydes were formed around 1993 in Thessaloniki, Greece, inspired by Robert Lewis Stevenson, ”Shadows”, ”Too Late Blues”, ”Rocky Horror Picture Show”, supervised by Edward Hyde & influenced by the hottest stuff of rock’n’roll and bands like The Spades, The Stooges, MC5, The Real Kids, Radio Birdman, Dead Boys, The Only Ones, The Velvet Underground, The Modern Lovers, Johnny Thunders, The Pretty Things, The Outsiders, Q65, The Music Machine, Droogs, The Lyres, The Chesterfield Kings, The Zakary Thaks, The Liberty Bell etc. Their 1st rock’n’roll strike was ”Big City” on a compilation tribute to The Pretty Things called ”Not So Pretty”, which came out in 1995 (Corduroy Records), followed by the EP ”Hard Lovin”’ (1997, Swallow It All Records). Their 2nd 7” ”Out Tonite”/”Sun Won’t Go Down” released the same year via the cool label of Corduroy Records, as well in 1997 The Hydes featuring with a great cover of The Only Ones ”Flaming Torch” through The Thing CD-comp vol. 20!! Once again & via The Thing CD-comp vol. 201 (1998), The Hydes covered Martha & The Vandellas’ ’63 anthem ”Heatwave”!! In 2002 saw the light of day a double LP compilation ”Standing In The Shadows (A Tribute To The Golden Days Of The Rolling Stones 1963-1967)” via Corduroy Records, The Hydes pay tribute to the Stones with an outstanding cover of ”Have You Seen Your Mother…”!!! The first issue of Rumble Skunk ‘zine came out in 2004 & The Hydes offer covers of ”Sour Wine” (Q65), plus The Masters Apprentices ”Wars Or Hands Of Time”. Over the years the band gigged with cool Greek rock’roll bands, as well with Radio Birdman, The Cynics, The Electric Prunes, Terry Lee Hale etc. 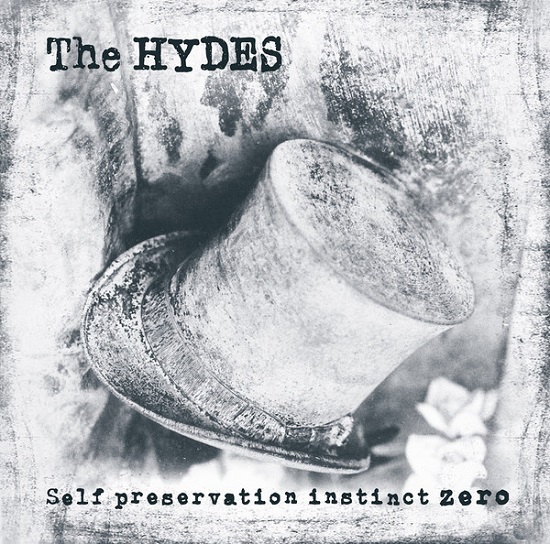 From the wrong side of town to the wrong side of time: The Hydes – ‘Self Preservation Instinct Zero‘ LP, on Rumble Skunk Records!!! Out Now!!! Their debut album including 13 original songs, recorded at their own studio (House Of Kicks), by Ghost between 2002-2006, mixed at Cue Productions by Ghost & Slim Chance & mastered at Cue by Yiannis Mavridis. Are we talking rock’n’roll here or what? A milestone!! !